Looking for an exatrordinary way to discover Vietnam? 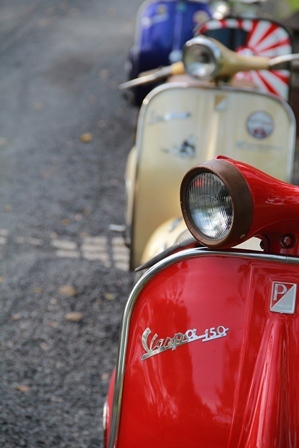 Try a tour by nostalgic Vintage Vespa. tree-lined boulevards and colonial architecture to scenic rides along Vietnam’s Southern coast and the highland resort of Dalat. Arrive in this vibrant city and take a stroll down the streets lined with small shops offering all kinds of handicrafts. Explore the city’s highlights with your Vintage Vespa, escorted by our vespa enthusiastic guide. Ride the lively China town and the less discovered tranquil rural areas of the metropolis and enjoy a cocktail at the riverside. Depart the city and set out on a scenic ride on paved roads along lush fruit plantations to Long Hai. Relax at a charming beach resort’s pool or take a dip in the blue ocean. (Vespa ride 130 km). Continue your journey with stopps to meet local people and observe their daily life en route. Take a break for a picnic at a deserted beach and visit the interesting light house of Ke Ga before arriving at your beach resort in Muine. The next day is at your leisure to explore the region individually or relaxing at the sandy beach of Mui Ne. Explore the beautiful surroundings of Nha Trang by Vespa or enjoy the many water sport activities Nha Trang has to offer. Take a swim in the turquois and cristall clear water or go on a snorkling excurion.